Peter Huson is currently a Junior at Washington-Lee High School. He is interested in all things Aerial Systems and has thoroughly explored many of their applications. 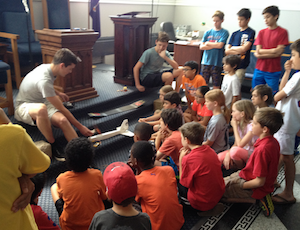 In an effort to share his passion for the Aerial Systems industry and give back to the community, Peter created the Arlington Aeronautics Class with Justin Szszerbinski to introduce younger kids to engineering. As the founder and three-year president of the W-L Bike Club, Peter has led more than 30 bike rides in the Arlington area. In 2013, he worked with Bike Arlington to install more bike racks for the growing community of bikers at Washington-Lee and is currently working to have a bike servicing station installed. Peter is also interested in wireless network security and through his research, has developed a PacketSniffer.jar tool that can be used to test network integrity. Download and try out the program here. In addition to leadership positions on DoSomething Club, Investing Club, and ACE club, Peter is a member of the Washington-Lee National Honor Society, Key Club, App development club and Entrepreneurship club.